Recently I started to design custom bottle labels for baby shower. Since bottle shapes and sizes vary throughout the United States I designed labels that will fit two standard size water bottles. Cut two pieces of paper : 2″ H x 7 4/8″ W (small) and 2 1/8″ H x 8″ W (large). Wrap the pieces around the bottles of your choice and use those that look best with the label size. The label ends may overlap or have a small gap between them, either way is fine. The label below, created in PowerPoint and inspired by a picture of row of ducks, is my recent design for a duck baby shower. Blues and yellows have been chosen to suit a baby boy shower and pink and green for a baby girl. Are you ready to print them? 1.Download my pdf file to your computer. 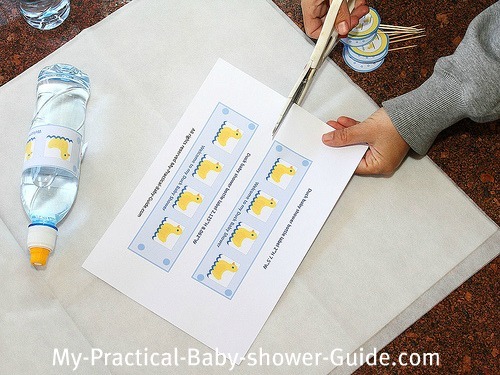 3.Cut the custom bottle labels. 4.Line your label up as straight as you can along the side of the bottle. Attach with either a single or double sided tape. 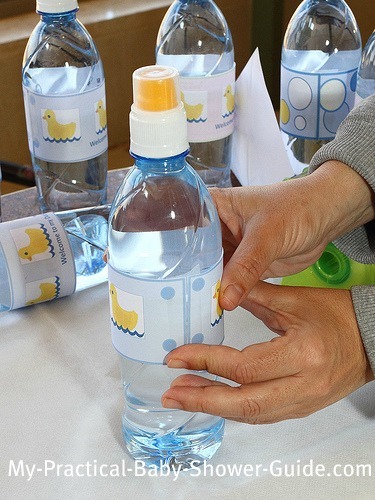 Custom water bottle labels for a duck baby shower theme. If you plan to use these bottle labels I will be more than glad if you share your pictures with me. 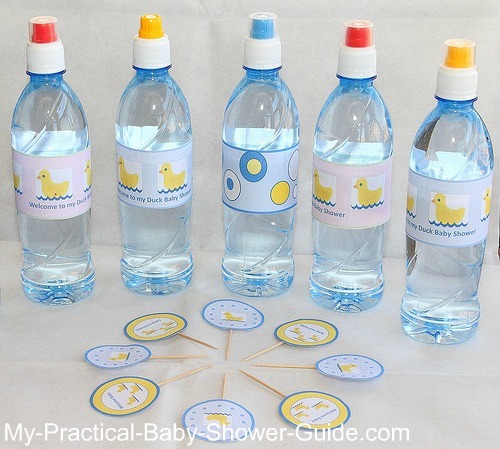 I would love if you comment on this post and finally if you are looking for more duck baby shower ideas please visit my website . 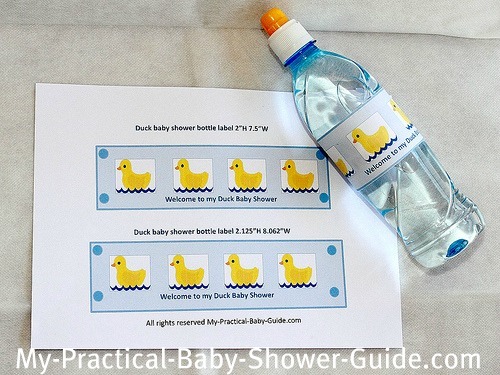 For more duck custom bottle labels visit Duck Baby Shower.